I couldn’t find any online page where you can calculate the check digit for a barcode with an arbitrary length of digits. There are pages where you can do this for barcodes with specific length, like EAN13 or GS1 barcodes etc. Since it was easy to create one from scratch, I thought I’ll do one and post it. Excel treat .csv files as text files and will replace all Unicode characters with “?” when saved normally. If you want to preserve the Unicode characters, you would need to save the file as “Unicode text (*.txt)”, which is a Tab delimited file. Since I couldn’t find any existing solution to preserve Unicode characters in CSV format, I thought I’ll give it a go in creating an Excel Addin to do just that. If you want to try this on your Excel 2007 or 2010, please download http://blog.jaimon.co.uk/UnicodeCSV/setupfiles.zip and extract the files to a folder before running setup.exe. Once the Addin is installed, it will look out for any CSV file being opened. If you’re opening an existing Unicode CSV file, this Addin will override the current saving method (either by pressing Ctrl-S, or clicking on any of the Save buttons/options from the Ribbon or menu) and will always save as a Unicode file. But if you are creating a new file and want to save that as a Unicode csv file, then choose the Save or SaveAs option from the newly created Ribbon item “Unicode CSV”. When clicking on Save from “Unicode CSV” Ribbon, it will make sure the file extension is .csv, if not it will prompt you to select another file name. Once a file is saved this way, then you don’t need to use the “Unicode CSV” Ribbon item any more, just save as you do normally. private List<string> unicodeFiles; //a list of opened Unicode CSV files. We populate this list on WorkBookOpen event to avoid checking for CSV files on every Save event. //Unicode file byte order marks. //Override Save behaviour for Unicode CSV files. /// This will create a temporary file in Unicode text (*.txt) format, overwrite the current loaded file by replaing all tabs with a comma and reload the file. /// <param name="force">To force save the current file as a Unicode CSV. if (force) //then make sure a csv file name is selected. //We only check for UTF8 and UTF16 here. The crux of the application is in ThisAddin.cs file, and I’ve put some comments wherever I can in the code to explain the functionality. But here is a brief info on how the code works. (As it was my first attempt at using VSTO (Visual Studio Tools for Office) and the fact that I’m a Java/Oracle developer for my day job, I’m sure the .net experts here might find a better way of coding in many places). Application_WorkbookBeforeSave – This will call the method SaveAsUnicodeCSV to override Excel’s default Save behaviour if the filename is in the global Unicode CSV file list. Once some basic checks are passed, SaveAsUnicodeCSV method will save the current file as a Unicode Text file to a temporary file, and close it. We now need to replace all the Tabs in that file with a comma. If the file is small enough (<= 1MB), I’m using File.ReadAllText and File.WriteAllText to read and write in one go. Otherwise I’m using a StreamReader and StreamWriter to read/write data in 10KB chunks. (BTW, these are numbers I plucked out of thin air, so feel free to change this to suite your use case). 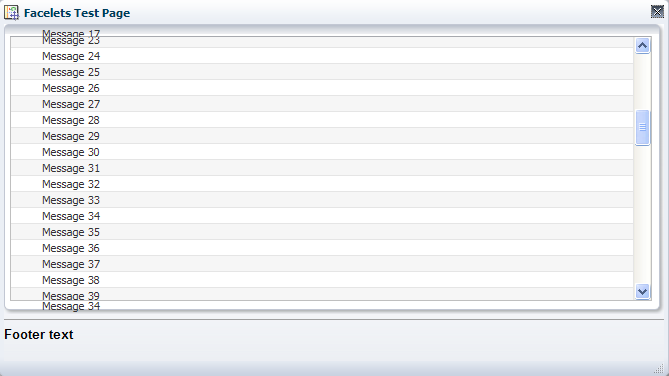 Once the new file has been created, we will then open the new csv into current workbook. Ribbon1.xml has the entries to create new Ribbon items. Because it only read the first few bytes, in most cases it only takes less than a millisecond to return the values. Please click here to download the source code. This post is an update to my previous post on making scrollable tables with fixed headers. I’ve had a few requests for adding additional functionalities, and I thought instead of cluttering the old post, I’ll do a new one for the updated script. To see it in action, please click here. Call fxheaderInit for every table you want to add scrolling. fxheader() is only required to call once. Width will be taken from the table’s width attribute, so make sure the table you’re passing in has got a width attribute. If width is specified in percentage, it will be calculated in regards to width of the document body, and not of the containing element (ie parentNode). Since width will be changed on window resize, fxheader() function will be attached to window.onresize, if any of the table’s width is specified in percentage. If your existing code has reliance on window.onresize event, please amend the fxHeader.js file. If your table is generated by a framework like JSF or ASP.net, you’ll need to avoid any possible ID collision as discussed on my previous post. As of this writing (Feb 2010), there are no tools available to convert your 10g project into an 11g project using Rich components, let alone something that can convert my jspx pages into Facelets. JDeveloper 11g FAQ confirms that, you need to do manual migration if you want to use Rich components. As Oracle points out, you’ll need to do some code refactoring to make use of new functionalities available with JSF 1.2 and Rich components (and Facelets). This post discusses a few points encountered during my by hand migration process I’ve done with a couple of 10g projects. If you are migrating to use Trinidad components instead of Rich components, then this paper would be more useful than my post. At the end of this post, you can download a sample 11g Rich Component project with Facelets pages to get you going. There are a number of good articles on this subject, so there is no point repeating any of that here. (See reference section for some useful links). For me, the main reasons for the conversion was the fact that JSP is deprecated from JSF 2.0, and Facelets is the new standard view technology, so at some stage, you’ll need to convert to Facelets. And also the Facelets pages render a bit faster. Some other benefits like templating may not sound great to an ADF user as Oracle already had templating support from JDeveloper 10g. Although the usage of Facelets was possible with 10g as discussed here, there was little IDE support like code completion available to you. Although the support improved in 11g, it wasn’t perfect as John Stegeman explains here. But it is a lot better now with Patch 1 release on November 2009 (Version 11.1.1.2.0 onwards). 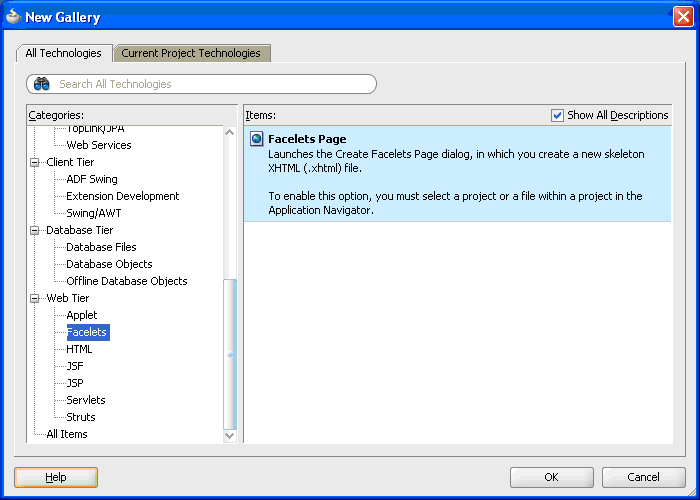 So please update your JDeveloper 11g if you plan to use Facelets at all. If you want to change your skin at run time, please see this forum post. It is always a good practice to clean up your project before doing the migration. One of the biggest clean up I did was to remove a lot of unnecessary bindings. Anyone remember this screen? Easy templating is one of the selling points of Facelets. There are good tutorials available on the net on this topic including this one from Jacob Hookom, the creator of Facelets. In our sample project, I’ve included a template file (template.xhtml) with a page header, content area and page footer. You can include any common functionality in your template file. If one or two pages in your application require things differently, you have the option to override them in those specific pages only. Then you may start with this code and copy/paste the main content from jspx page, excluding anything that is already in template file. You can override any named UI component you’ve defined on your template file. Oracle has done quite of lot of work with af:table component. It is more intelligent now, so it will only fetch the data as you scroll along, if you wish so, something similar to Yahoo Mail’s inbox. It is quite a useful feature if you have a big table, but at least in our case, the user experience wasn’t that great, especially when you scroll with your mouse scroll wheel. You’ll see quite a lot of “Fetching Data” messages. Again a change you’ll notice here is the lack of separate pagination controls. So even if you set rows=”15” on af:table, it is not going to put pagination controls when you have a table with more than 15 items. It isn’t entirely bug free too, as discussed here. I’ve provided a dirty fix on the forum, but as I mentioned there, it is something Oracle needs fixing. On the tag library file sdetails.xhtml, if we include the partialTriggers directly as shown below, it will result in a run time java.lang.IllegalArgumentException: Cannot convert x of type class java.lang.String to class [Ljava.lang.String; as ADF Faces expect the attribute value of partialTriggers as a String array. You can see the full implementation on the sample project. Navigation specified in faces-config.xml doesn’t work for pop-ups when used with Rich Components! That was a surprise, and took a while to figure out Oracle has moved all their extension work on navigation to task flow files. 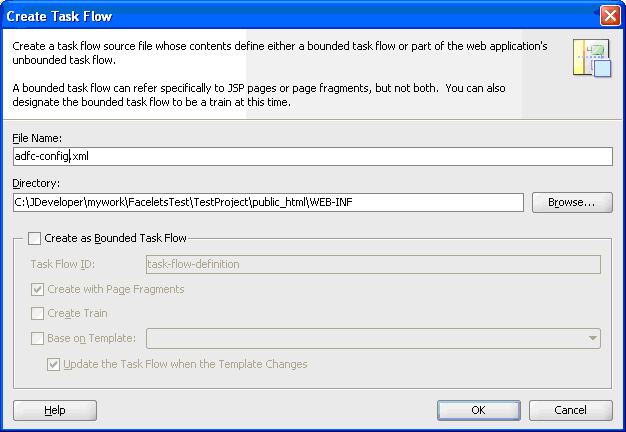 To make this work under 11g, first you need to add an ADF task flow page. 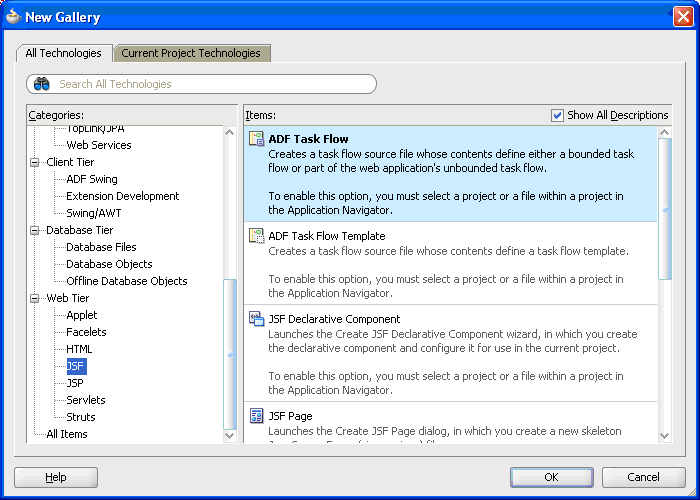 From new gallery, select ADF Task Flow off Web Tier/JSF category and click OK.
Again, the sample project includes a working implementation. This could be a simple task or a bigger one depending on how many bindings you’ve used in your project, and how much re-factoring you want to do. What I did was to replace the word Core with Rich using Search/Replace in Files option. So basically, your CoreTable becomes RichTable, CoreInputText becomes RichInputText etc. And in imports, replace all oracle.adf.view.faces.component.core. with oracle.adf.view.rich.component.rich. JDeveloper 11g/WebLogic is only certified to work with JDK 1.6. Make use of the new functionalities available with JDK 1.5 and 1.6 like Generics, new for loops, auto boxing etc, if you aren’t already using JDK5 features in your 10g projects. Please see the release notes for JDK 1.5 and JDK 1.6 for more details. This Oracle document explains about various data sources migration options. What I did was to create IDE connections and then just drag the connection to different applications via Database Navigator. This will result in creation of connections.xml in .adf/META-INF folder on your application folder. Once you add the connection, JDeveloper will create necessary JDBC module when you run or debug your application with the integrated WebLogic server. Obtaining data sources from your Java code. Just a side note, here the connection name you set up in JDeveloper will be just “preProd” and not “preProdDS”. In a way, it is a good thing, so we can finally get those IE6 users to upgrade. But that can also be the problem, getting them to upgrade before they can use your 11g application. If you desperately needs IE6 support, then you should stick with Trinidad components with 11g and not Rich components. Although IE8 is officially supported with the patch 1 release as mentioned here, there are still some rendering issues with certain components (as of February 2010). One of them is the treeTable component. 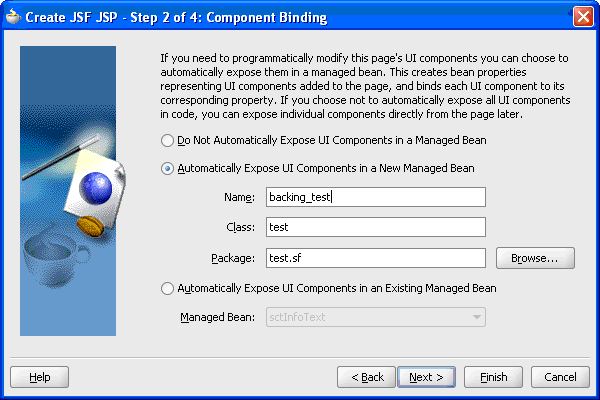 If you’re on IE8, open test.jspx from my sample application and click on Tree Table Issue button. As you can see, when you scroll, some texts are getting displayed outside the scrolling area. This doesn’t happen in any other browsers I’ve tested. Hopefully Oracle will fix it in their next release. You can download an 11g sample application from here. Run index.jsp or test.xhtml to start the application. It show cases some of the functionalities we’ve discussed on this post, including usage of Facelets templates, tag library, inline pop-ups, ADF-C page flow etc. But we also wanted to take peek at the log data in real time so when we see an error being generated we can change the level back to ERROR and look at server’s log files for debugging. Something like doing a tail –f logfile.log from the server. In some places, developers are not given SSH access to server, and needs to contact the DBA for any log files. Even if the developer has access to it, SSH access may be limited to internal traffic, and if you want to fix an issue from home, you’re out of luck. A browser based solution would be ideal in these cases. So here we are discussing such a solution, which should be very easy to implement in your own project. Once you ran your application, point the browser to, http://<<your server>>/<<your context>>/livelog to get started. I’m assuming that you’ve a valid log4j.properties or log4j.xml file in your classpath. This utility itself uses Log4J for logging with the logger name LiveLogger. Here is a sample screen shot of what you should be seeing on the first page. This is where you can select a logger to change its severity or start streaming log data. Once you select the logger, you’ll see log data being displayed on the left hand pane as shown below. You can also use this page to change the severity level of your selected logger. Once done, change the level back and stop the monitoring by clicking on Stop button. If there is an influx of messages, then it would severely affect the performance of your application. So I’ve limited the number of messages we can receive on the queue to a 1000. At the moment, the only thing that is configurable via web.xml is the maximum number of clients allowed. There are a few other parameters, which I haven’t bothered to get it from web.xml. These are listed here, and I believe all of them are self explanatory. My Netbeans project files can be downloaded from here, if you want to make any changes and create the jar file. There is also an Ant target “createjar” which generate the jar file. You’ll need to change the location of the jar file though, as it is hard coded at the moment. If you are using any other IDE, create a new project and copy/paste contents of src and web folders to relevent locations. There is scope for improvement in a number of places. On the server side, we could use a separate thread to write messages to the client to reduce some of the overheads. But as you already know, creating threads from Servlet is a no-go area. Two JSRs (236 and 237) were created as possible solutions, unfortunately none of them made it to JEE6. While JSR 236 remains inactive, last year JSR237 was withdrawn. There is a commonj project, which can be utilized as a possible solution. I would appreciate, if you could let me know of any improvements you make to this project. In this post we are going to extend on that, and showing a sample where we get a list of movies for a particular user and display it in a list with thumbnail images. Clicking on each link will load the movie in the player area, and will start playing (if auto play is enabled). To demonstrate Moogaloop’s event system, I’m displaying a “Please wait” message at the top when somebody clicks on Play, and when we are past the first second of playing, we are hiding this message. Please see Moogaloop’s API documentation for more details. Although I’ve added two event listeners to show the capabilities, onProgress event should only be used with some caution, as it fires a lot of events every second. If you are using it, make sure the code doesn’t run for more than a few milliseconds. For a live demo, please click here. You can download all the required files as a zip from here. It’s been tested on the following browsers all running on Windows XP. First we put a scrollable div container around the table element as in our first solution. Create a container on top of the table to place the headers. Attach scrollHeader function to the table container div’s onscroll event, so that we can align the heading when the table is scrolled horizontally. We then clone the table and place it in the header container. Container height is set, so that only the header row is visible. We then set a negative margin top on the original table to hide the actual header. Attach fxheader function to window onresize event, so it works when window get resized. Download fxheader2.js and include it in your project as explained on the implementation section to get started. 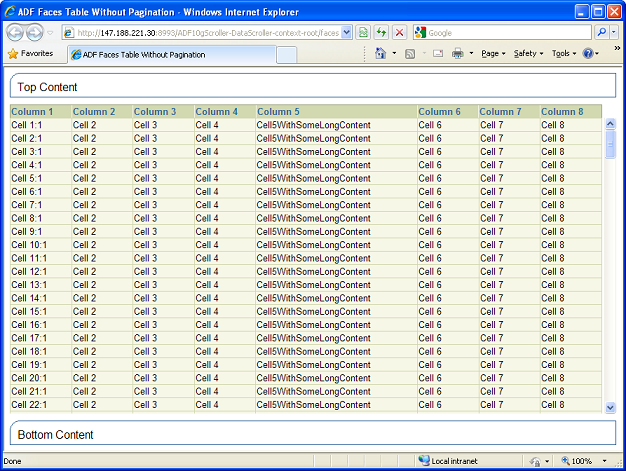 Solution 2 will give you very accurate column widths at the expense of doing a full table cloning. If you have a table with lots of rows, this can take a while. If your rows have elements with unique IDs, you will have to change it on the cloned node to avoid ID collision. Although it will work, it will lead to a sluggish user experience on pages with really large tables. In solution 3, we are doing a fast clone without any child elements. Then we add the first row to it and set individual column width separately based on the offsetWidth property of each cell. You’ll have to offset cell margin/padding when setting the width. In our example, I deduct 3 from offsetWidth and that works fine for our table in all browsers I’ve tested. Everything else is similar to solution 2. Although in theory it is similar to solution 3, I had to make a few changes to make it work for a table generated by ADF Faces. The problem is ADF Faces creates three HTML tables for each af:table element. 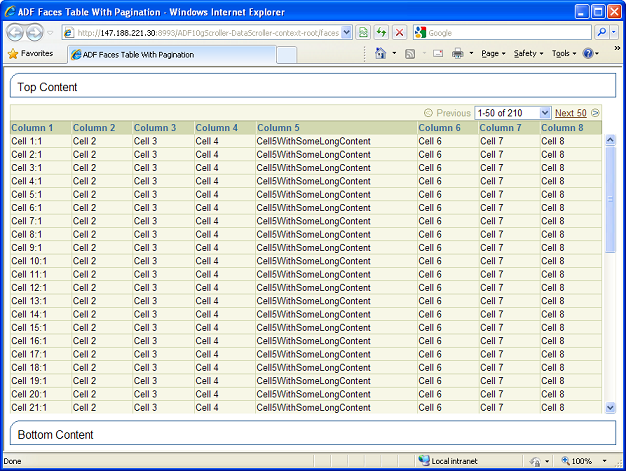 First and third tables are created for pagination support. It doesn’t create an ID for the actual data table itself, so we need to access it as a childNode of the container element. If pagination is there, we need to place this above our fixed header. Since we have the scrolling functionality, I thought the second pagination controls below the data table is not necessary, and I’m removing it from the page. When cloning table data here, we have to update ID field of each element to avoid ID collision. We also have to set the correct selected index value for pagination selector combo box. Another functionality I’ve implemented here is the ability to auto stretch the table content to fit the page. You should pass in the ID of your last container component to make it work. Please see adjustHeight function in fxheader.js for more details. As with the second and third solutions, you could add the following line to your JSPX page to get this working. Where testTable is the ID of your af:table element and footerContent is the ID of your last container component for stretching. Partial Triggers are required here if used with pagination. As this is my first blog, I’m going to write an update for a C# library I wrote in early 2001 on csharphelp.com site. Although it was the first open source FTP client library for .Net, there is a lot changed since then. But I still get emails from people asking about bugs, license etc. And I always send the same reply (when I get the time to do that). From framework version 2.0, Microsoft has added WebClient class and you could do a lot of networking stuff with it. It is much easier to do FTP downloads/uploads with this new class. There are a lot of articles on the net on how to use FTP with WebClient class, so I’m not going to reinvent the wheel here. Some sites I’ve got through Googling is listed here. So if anybody is still using my old library, please update your code to use WebClient class. Any information or code published here is on an “AS IS” BASIS WITHOUT WARRANTIES OR CONDITIONS OF ANY KIND, either express or implied. And I accept no liability for any damage caused by using this in your environment. You can only download and/or use the code if you adhere to this policy. Source code for some projects are distributed with an Apache 2.0 license.